Pont Du Gard is definitely the best place to visit in the Languedoc-Roussillon, South of France. This is definitely the place you have to visit! Here, I don’t know where to start. I am speechless. You know when you are looking at some photos of the places, cities, monuments that tourism offices promote, they always exaggerate a bit. So they make the place to look much better then it is in real? These are well known tricks being used to get more visitors, customers etc. But when I think about the The Pont du Gard I am sure it was not a case..why? Firstly, the real is really as amazing as it has been shown on the postcards and I would say it is even better as you cannot believe that such a stunning monument is in France, so close and easy to visit. But how my experience started with The Pont du Gard? Well, it was a bit disappointing as I didn’t expected that I would need to pay for a parking to get to this monument and I would never expected to pay 18 Euros just to get there by car. So, with a bit low mood, I entered the garden and I was…overwhelmed, speechless, happy & not sure where to start talking photos as all looked amazing for me, different from different angle and so huge and stunning. So, at the end of this visit, I can honestly admit that it was worth those 18 euros we paid for entering the The Pont du Gard, not to mention the fact that we got an access to very interactive and interesting museum, the impressive Pont du Gard Visitors” Centre where we spend some time as well and the Mediterranean garden, ideal for a picnic. Anyway, I am sure you have already seen the pictures, images of The Pont du Gard somewhere, haven’t you? But do you know anything more about it? Well, let’s start from the beginning to explore The Pont du Gard. The Pont du Gard is located in the South of France, just north of Nimes. It is an extraordinary Roman aqueduct and one of 4 UNESCO World Heritage Site located in the South of France. The Pont du Gard, is one of the most dramatic monuments of Roman architecture in France.It was built around AD50 to carry water over 50 km from Uzes to Nimes. 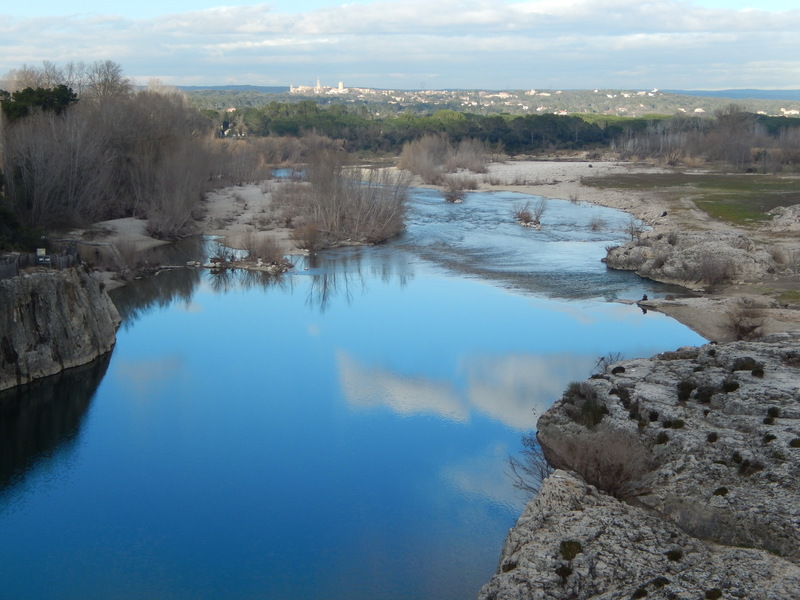 Typically for single-minded Romans, they decided on with the project despite the fact that along the route they would need the water to cross the River Gardon. They made it and this Roman aqueduct remains one of the most impressive engineering feats of the ancient world. The waterway descends only 17m along its 50km course, with the Pont du Gard aqueduct solving a complex technical problem. 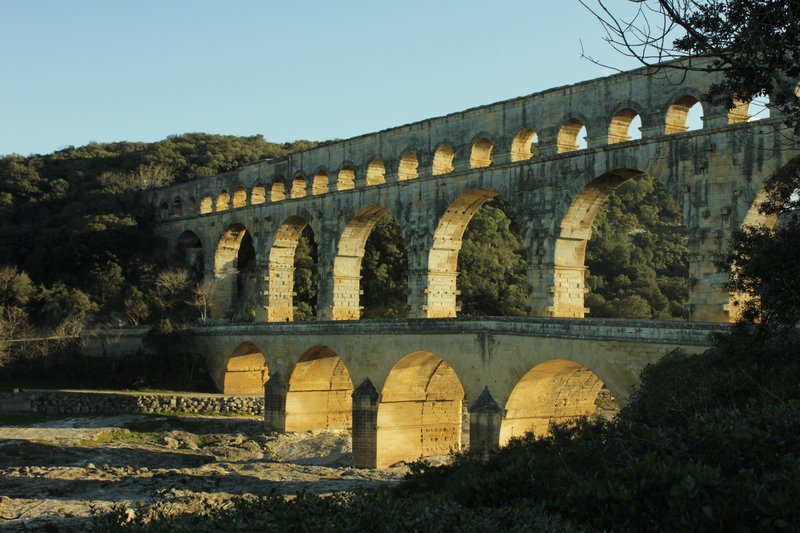 It is very interesting to find out on how the Pont du Gard has been created, The work on the aqueduct started in AD38 and was completed in AD 52. A thousand men worked on the site, using more than 50,000 tonnes of stone. The aqueduct delivered 35,000 cubic metres of pure water per day to the baths and fountains of Nimes. The average slope of the channel is 24 centimetres per kilometre and the Roman Engineers used the natural slope of the land to convey the natural spring water. The water crosses the river at a height of 48 metres. The aqueduct functioned effectively until the third century. Partially demolished in the fourth century, the aqueduct was finally abandoned early in the sixth century. The Pont du Gard was first used as a bridge in 1295. An earthquake in 1448 caused significant damage to it. In the eighteenth century, Napoleon ordered the restoration work of the aqueduct. So, I am very thankful to this Napoleon as we have a great opportunity to admire it now and use it, walking on it & talking photos & admiring the view. So, yes the Pont du Gard is a very special and amazing place. For me, it has been the best place we have been to during our holidays (and we visited a lot!). 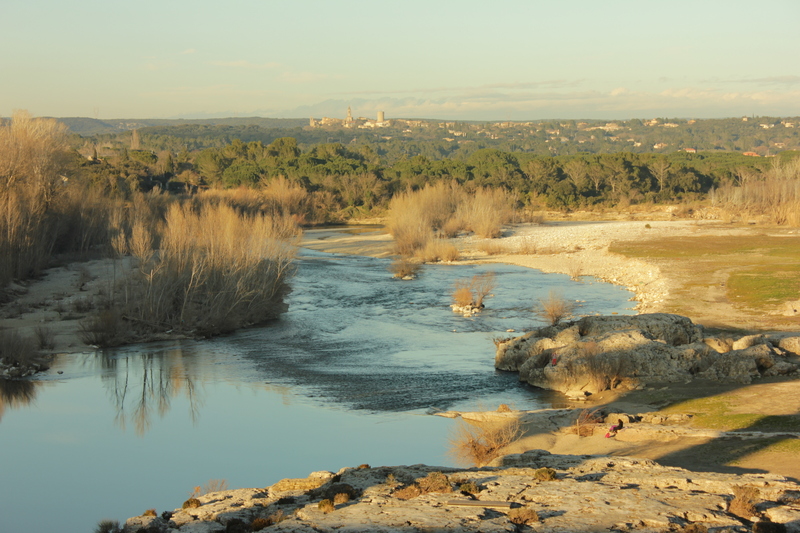 Pont du Gard and Camarague – are the best highlights from my holidays. SO go and enjoy if you have a chance and in the meantime take the virtual tour there.